Can you believe it? We are already in May. Half way through the year almost. 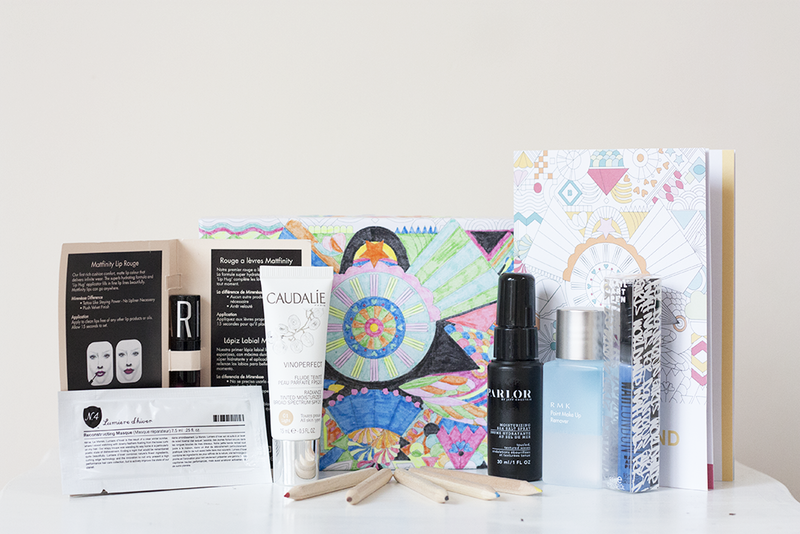 This month's Birchbox was incredible. 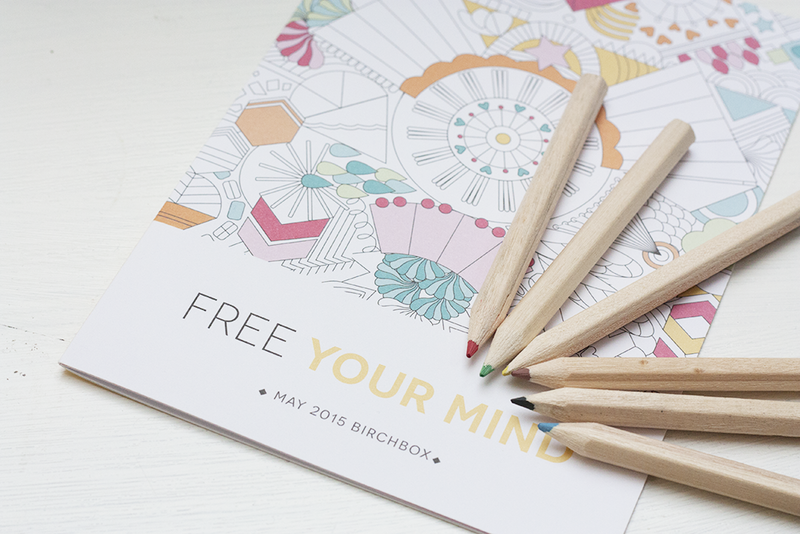 Not only did you receive some great products, but you had the chance to "free your mind" and colour in the box! Which as your can see, I had a great time doing so! It took me a whole Saturday evening! Below are the products listed and a quotation from Birchbox of each product. We love a classic gloss as much as the next girl, but there's something about shine-free lips that gives our style a dash of modern chic. This lip colour from Aussie brand Mirenesse lets us rock the matte lip look in an on-trend, foolproof way. The mousse-like texture fills in fine lines for fuller-looking lips while a proprietary blend of Gel-lite technology delivers vibrant colour that won't fade or feather. Number 4's Lumiere d'Hiver Reconstructing Masque is packed with soy protein to reconstruct and strengthen; shea butter, jojoba seed oil and sunflower seed oil to nourish, condition and moisturise and silicone polymer to detangle and smooth. A beautiful treat for your locks, it's one of our favourites from this high performance brand. As skincare obsessives, there’s nothing we love more than a moisturiser with added benefits so when we heard that Caudalie had created an innovative new product combining our beloved Vinoperfect range with a little complexion coverage we were sold. The ultimate ‘all-in-one’ product, this oil-free formula not covers imperfections but cares for your skin day after day: dark spots will fade, you skin’s natural radiance will shine, and you complexion will never have looked more even! Beach hair is no longer reserved for long weekends. Bottling the effects of that salty air, this spray from NYC stylist Jeff Chastain offers instant volume and a tousled texture. Sweet almond extract infuses strands with softness, fullness, and brilliance, while vitamin-rich algae extract nourishes and protects the scalp. Adding to this spray’s addictive nature is the scent of ripe peach, fresh-cut grass, and white woods. All products from the line are safe for colour-treated hair and are free of sulfates, parabens, and gluten. When you’ve spent the day rocking a smoky eye or a bold red lip, there comes a point when you just need to get it off. NOW. So, when your usual face wash isn’t enough, this quick-dissolving make-up remover from RMK will get things sorted in a flash. Formulated with Squalane – a highly moisturising complex to leave skin ultra hydrated – it removes shadow, liner and waterproof mascara without breaing a sweat. Plus, it’s been specially created to protect the delicate eye area without any greasy residue so you don’t have to worry about redness or irritation. Eye-catching nails are way more than just a trend – they’re a must-have accessory that’s here to stay. So, when deciding who we should turn to when it comes to getting creative, there was only one brand that sprung to mind: WAH London. Always one step ahead, their signature nail pens have both a pen nib for freehand creativity and a striper brush inside for drawing the perfect line; making nail designs easy and fun (and ideal for on-the-go touch ups!). All that’s left to do is to let your imagination run wild! If you're thinking about joining Birchbox then I highly recommend it. For £10.00 a month plus £2.95 delivery, you really can't go wrong! Love the sound of this, so creative and fun. The nail art pen sounds incredible!